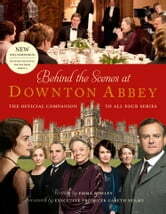 A revealing look backstage at the hit TV show Downton Abbey. In-depth interviews give an exclusive insight into the actors’ experiences on set as well as the celebrated creative team behind the award-winning drama. A lavishly illustrated book full of images from the new series including those stunning 1920s costumes, which will delight the millions of devoted Downton fans. Step inside the props store or the hair and make-up truck and catch a glimpse of the never-before-seen secret backstage world. Expertly crafted with inside knowledge and facts, this book will delve into the inspiration behind the details seen on screen, the choice of locations, the music and much more. With a perspective from the director’s chair and rare insights into filming, this is the inside track on all aspects of the making of the show.